Relax and enjoy a scenic and easy day guide trip. Within a 1.5 to 3 hour drive from Iron Station, North Carolina, our home, are located some of the finest world class fly fishing destinations an avid experienced fly angler or beginner fly angler can experience in their lifetime. Peak fly fishing seasons in Southern Appalachians are Spring and Fall due to cooler air & water temperatures in the mountains. The southern Appalachian Blue Ridge Mountain ranges provide spectacularly beautiful freestone and limestone rivers, creeks, streams and tailwaters. The southern Appalachians are unique, we can fish all 12 months of the year, unlike most western US states that you can't fish for 5 to 6 Winter months. 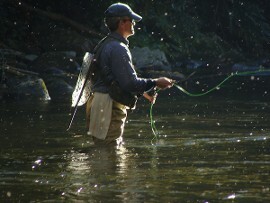 Due to our geographic location our southern Appalachian rivers fly fish fantastic year round. Whether its 5" to 10" inch wild Speckled trout deep in a wilderness stream, holdover 18" Rainbow trout in a DH/HS river or a 26" inch Wild Brown trout on a tailwater or a 30" inch 16 lb. Trophy Rainbow trout from a private water stream, we have it all available on our doorstep 12 months of the year. 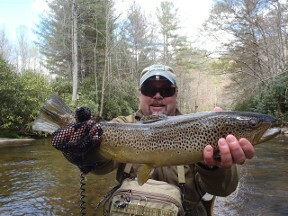 North Carolina we can fly fish year round!! -North Carolina is home to thousands of miles of freestone rivers & streams in the Southern Appalachian Blue Ridge Mountains. 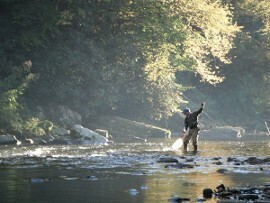 Pisgah National Forest, Nantahala National Forest and Great Smoky Mountains National Park are all home to rivers & streams with world class Rainbow, Brown & Brook Trout fly fishing opportunities. Simply stated, North Carolina fly fishing for trout is world class and knowing exactly where to go and what to use is the key to your success. We know where to go and which flies, emergers, streamers or nymphs to use. -Tennessee Appalachian mountains are home to some of the most beautiful countryside and limestone rivers and creeks in the United States. Tennessee rivers and tailwaters provide some of the most healthy populations of large wild Brown, Rainbow trout any fly fishing angler could ever dream of. Brown trout in the 12" to 20" inch range can be found holding in Tennessee tailwater limestone streams with population densities close to 5000 fish per mile. We know exactly where to fly fish on these East Tennessee Blue Ribbon streams and exactly which dry flies & midges to use to catch these prized trophy fish. -Southwestern Virginia's lush green rolling hillside pastures are home to scenic, spring fed creeks and limestone streams with huge bio-mass creating world class Trophy Trout fly fishing opportunities. The private trophy waters we have access to its not uncommon to catch a trophy Rainbow in excess of 26" inches and 10 lbs. 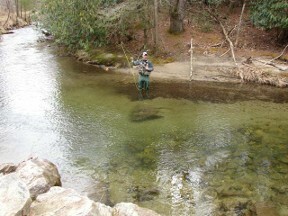 or catch several fish in the 18"- 20" 5 lb range all day long. We know exactly where to go, when to go, exactly what to use. That's why you hire us as your guide. For business reasons we do not disclose the names or precise location of our trophy creeks and rivers.